Deputy Private Secretary BPS-17:Rs.3000/- P.M.
Assistant Private Secretary BPS-16: Rs.2000/-P.M. Junior Private Secretary/Stenotypist BPS-14: Rs.1000/-P.M.
Deputy Private Secretary BPS-17:Rs.2000/- P.M.
Assistant Private Secretary BPS-16: Rs.1500/-P.M.
Khalid bahi, salam & to all of this forum the tenure of PP government ended now. The Secretary, Finance is all in all. Our case under process for time scale, the Finance Division its should own decide or fixed the time scale for stenographers. Please pursue the case on immediate base. Hope for the best and if any latest updates, please inform through this forum. Many thanks for doing uncounted and historic achievements you have grabbed for this poor cadre and deprived cadre i.e. Steno community. It is hoped that special pay + computer allowance will finally be achieved for Steno community. However, I wish to draw your kind attention that govt has recently increased late sitting allowance @ Rs. 50/day to Rs. 100/day for conveyance charges for late sitting for government servants. It was a benefit which was given to Steno cadre for their long long duty as they usually have to sit in offices after closing hours daily without no financial gain but this Rs. 50/- per day was withdrawn on the plea that Stenographers are now gazetted hence can not be given late sitting allowance. I do not understand what is this Bs-16 (non-gazetted) is I do not think that this cadre even exist in Pakistan as a man is in BS-16, he is gazetted, that's all. But our their meager benefit was stopped and we are now again performing late sitting for none of our benefit and without any financial gain. I request you to kindly use your kind linkages to get this condition removed for BS-16 (non-gazetted) so that this benefit which comes to Rs. 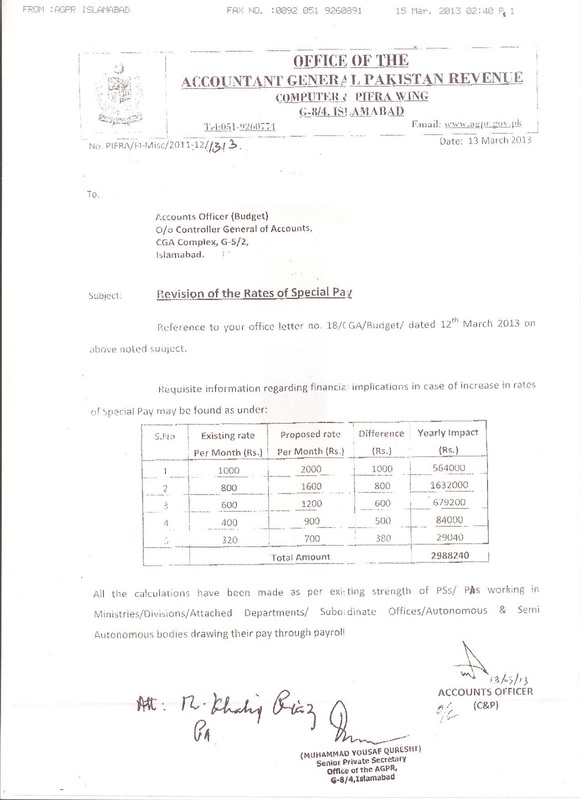 2000/- per month may be given to all Steno Typists/Stenographers as they are the only cadre who generally performs and sits in offices with senior officers after closing time daily. This is un-just approach of Finance Division, it must be given to Stenographers BS-16 compulsorily as being their just right. Hope you would use your best efforts to get this benefit of Rs. 2000/- for all steno cadre by removing this condition of BS-16 (non-gazetted) so that Stenos can get this benefit also. Hope for your prompt help in this context please. Case recommended and under submission to Secy. Finance for final approval. Dear Khalid Riaz AOA The period of two months for issuance of notification regarding premature increment on up-gradation is going to laps but nothing is heard from Ministry of Finance. Please update the colleagues. Janab the said period of two months has already be lapsed on 11.03.2013. The Ministry of Finance is delaying the issue and they have failed to comply with the order of the honourable Court. We all are making requests to Khalid Bhai. The Federal Stenos have to proceed with him by showing unity and to achieve the target well in time. Only our unity is the way of success. A joint team have to submit the demands of the stenos union..
Aslamo Alaikum Wa Rehmat Ullah! By the Grace of Almighty Allah, today i.e. 21.03.2013, Sindh Government, Finance Department, Karachi has issued the Notification for upgrading the posts of Private Secretaries/Stenographers w.e.f. 23.12.2011. Governor Balochistan has already approved the summary of upgradation of posts of Private Secretaries/Stenographers and Notification is yet to be issued by Finance Department, Quetta and will be issued shortly. Now, in all over Pakistan, Private Secretaries/Stenographers have been upgraded except in Azad Jammu & Kashmir. This is only with the effort of Mr. Khalid Riaz who is the Hero of Stenographers in all over of Pakistan. Now, the goal of Mr. Khalid Riaz has been completed upto the extent of upgradation. Well done Mr. Khalid Riaz. First of all I thank to Almighty Allah who gave us much patience and in the end give reward secondly It is a great pleasure to hear about the approval of upgradation of stenos in Sindh and Balochistan. In the end, I would like to appreciate the efforts of Mr. Khalid Riaz, the legend of this scenario whose efforts, struggle and in time action give us to see this happy occasion. May Allah bless all of us and give us more patience, courage and determination. My Allah bless you all. I have requested Mr. Khalid to kindly use his linkages to waive off this late sitting approval (conveyance allowance) for BS-16 (gazetted) as there is no B-16 (Non-gazetted) cadre exist in Pakistan. This way a large number of APS/Stenographers will get a financial benefit of Rs. 2200/month (least), this is a major financial benefit as compared to Rs. 300/month which we are demanding and I think it would be far easier to get rid of this so called BS-16 (N.G) bottle-neck from it. 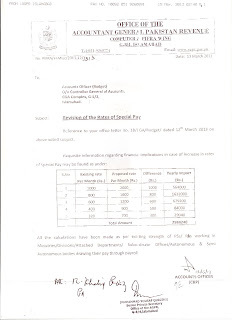 I request all of you to kindly do use your linkages along with Mr. Khalid so that this financial benefit of Rs. 2200/- may be ensured for APS/Stenos. Hope you would be fine. I need your kind help that audit authorities in different government department are not considering the cases of anomalies of those servants who have acquired qualification increments. It has come to my notice that some persons who have fought cases in FST/Courts are being given the increments and their anomalies are being removed but on the other hand, they are not considering the cases of remainders. I need my Finance deptt brothers and all other P.As kind help to kindly intimate present position of the cases whether in their departments persons who have qualification increments if their cases for anomaly are being dealt with accounts department or what the position is. Kindly provide any legal documents/notifications in this regard so that we can file our case with full supporting docs. Need your kind help, for any further queries, feel free to write to me here on our beautiful site.